And they say, economics & numbers are unromantic. Frankly, we don’t remember so many people speaking so eloquently about payroll numbers. Dow‏Verified account@mark_dow – Beautiful numbers. The best numbers. Guess what David Rosenberg said about Friday’s NFP numbers? David Rosenberg‏@EconguyRosie– Nothing quite like writing up the payroll synopsis from Barbados. The report was as sunny as the weather here and compels me to revisit the 9th inning cycle theme. Revisiting 9th inning cycle theme is a big deal indeed. But didn’t unemployment go up a bit? Ben Casselman‏Verified account@bencasselman– Unemployment rate rose, but so did participation — more people reentering the labor force. Jim Cramer said “this economy is very strong and it is not overheating“. Rick Santelli pointed out there was “no wage pressure“. Jim Paulsen of Leuthold Group called it Goldilocks & wondered “if Fed is done a bit“. With mega-serious terms like “very serious synchronized global growth downturn”, shouldn’t you expect the below? With all of that, are you surprised to see the result? 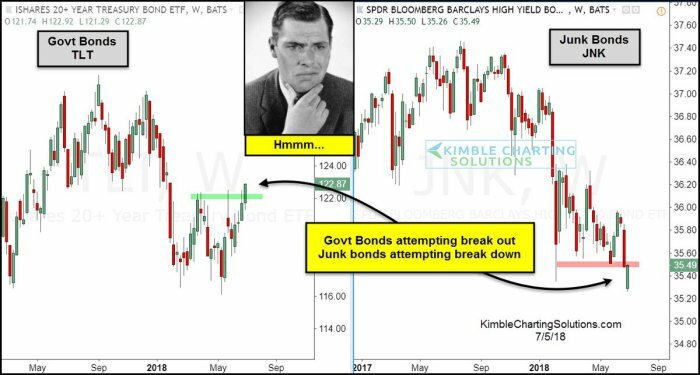 Rick Santelli spoke on Thursday about the large Pension Fund demand for long maturity Treasuries and how that might be the bigger reason for continued flattening of the Treasury yield curve. Santelli has also spoken about how the 7-10 year curve might invert before others. Well, the 7-10 year spread closed the week at 4 bps and the 10-20 year spread at 5 bps. Is it time for the Fed to be done a bit as Jim Paulsen said on Friday morning? 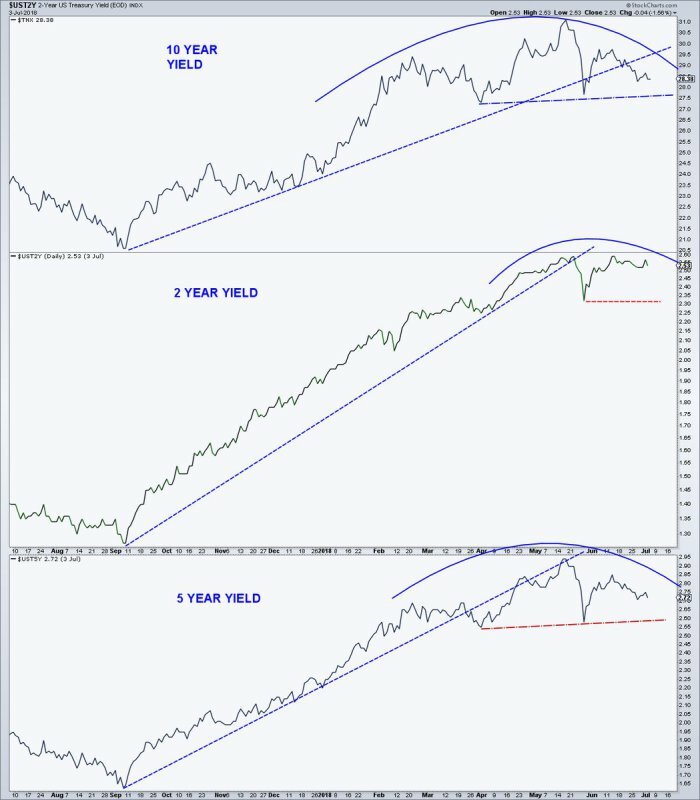 Mark Arbeter, CMT‏@MarkArbeterJul 5 – Treasury notes/yields just pausing or rolling over? $TNX Market rates (treasuries) move before government rates (fed funds). 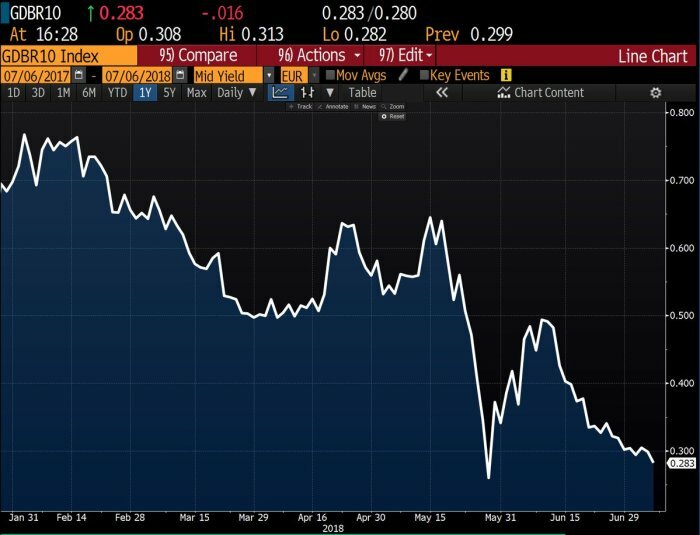 This was a good week for Treasury bulls as yields kept falling, especially at the long end with 30-year yield down 6.3 bps & 10-yr yield down 3.7 bps. In contrast, the 2-year yield rose by 1.3 bps on the week. 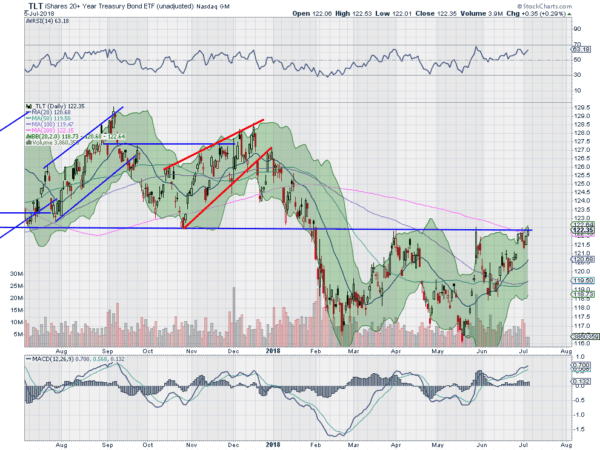 TLT rallied by 85 bps and EDV, the Zero Coupon ETF, rallied by 1.5%. If correct, shouldn’t it mean breaking below some recognizable level? If it does, where could it go? But is there any one who sees resistance looming above? This might be laughed at by some & perhaps it should be. But to us, the markets felt on Friday morning as we recall market sentiments on January 17, 1991. Then the stock market had gone through a 20% correction since Saddam invaded Kuwait in August 1990. There was serious nervousness about the start of the bombing campaign on January 17, 1991. But the reverse happened. The bombing began and the stock market took off. Probably because the uncertainty had ended and the markets were convinced of US success. Probably we are totally wrong but that is sort of how we felt on Friday morning. 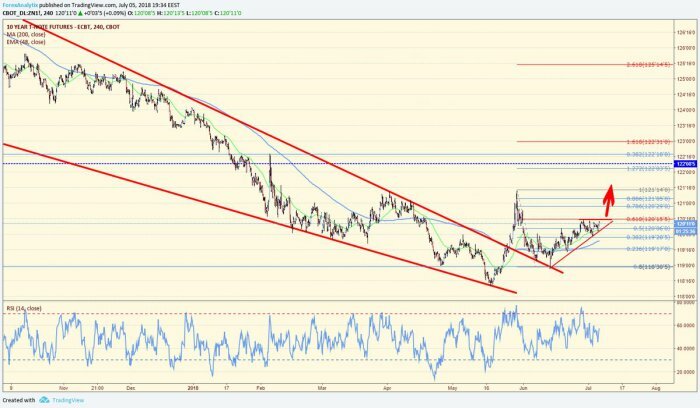 The tariffs had been imposed, the uncertainty was over and the Non-Farm Payroll report was so sunny that all fears of a trade war backfiring on America were at least temporarily put away. 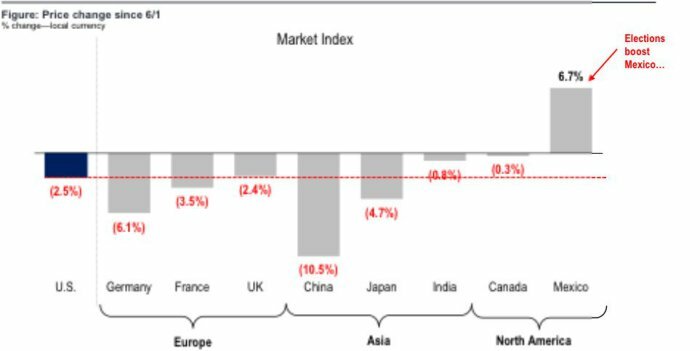 Interestingly, Ian Bremmer, founder of the Eurasia Group, came on CNBC to argue that tariffs, while they might rise higher than now, will not do damage to US economy or even to global trade, which is kinda what the markets concluded after the payroll number. Since tariffs on physical goods involve shipping, how countries handle shipments or deliberately mishandle shipments can affect trading costs. 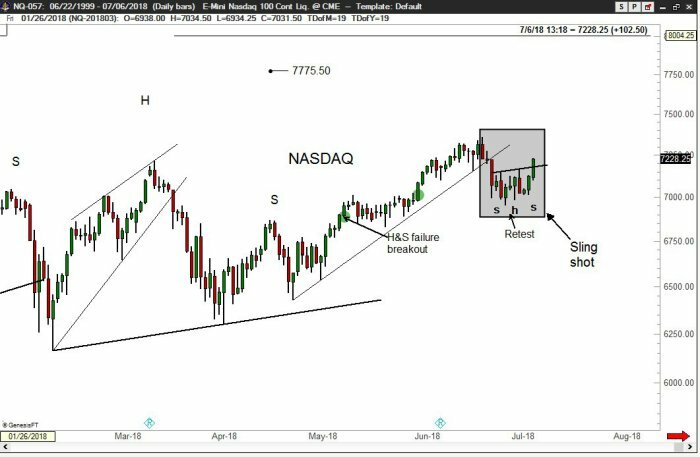 Listen to Lori Ann LaRocco of CNBC explain this somewhat in the clip below. The clip is 2 weeks ago but may now be more relevant given the implementation of the first set of tariffs. This is a topic that interests us. We plan to read Ms. LaRocco’s book “Dynasties of the Sea” and review it, assuming we understand this complicated subject. 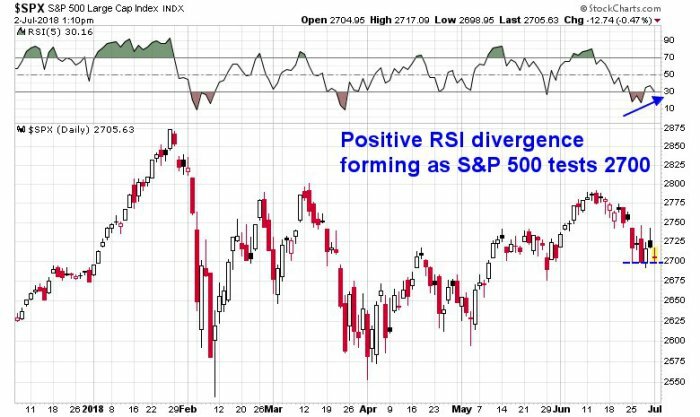 Cam Hui, CFA‏@HumbleStudent – Mon Jul 2 – Positive RSI divergence forming as $SPX tests 2700. Watch the close! 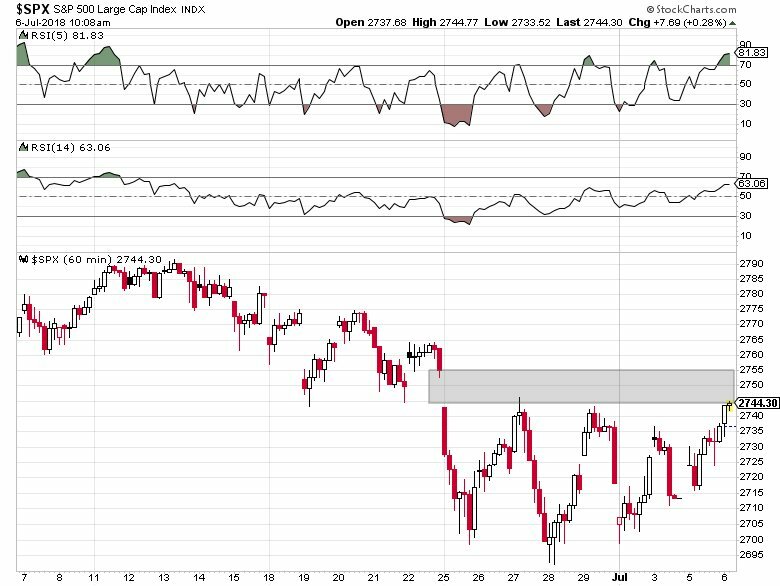 Neil Blalock, CMT‏@NeilBlalock – Thu Jul 5 $SPYStarting to see higher lows in this tight coil. In both price and relative strength. The S&P did explode out of this coil and rallied both on Thursday afternoon & on Friday. Did any of these gurus say what’s next? That’s the S&P. What about small caps? 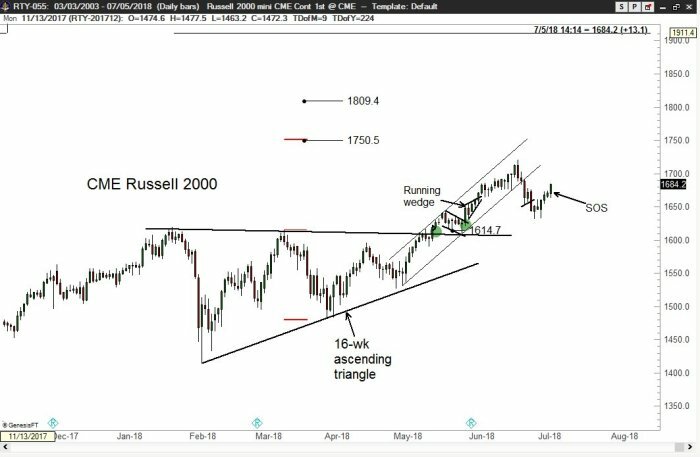 Peter Brandt‏Verified account@PeterLBrandtJul 5 – –#classical_charting_101Today’s SOS in Russell likely re-confirms major uptrend. See Factor Alert dated July 2. This was signal I was looking for. That’s technology, the largest sector in the S&P. Next is Health Care which was highlighted on Friday by Carter Worth of CNBC Options Action via XLV. That brings us to Financials, the sector that just can’t go up. Is there any one who is optimistic on Banks? 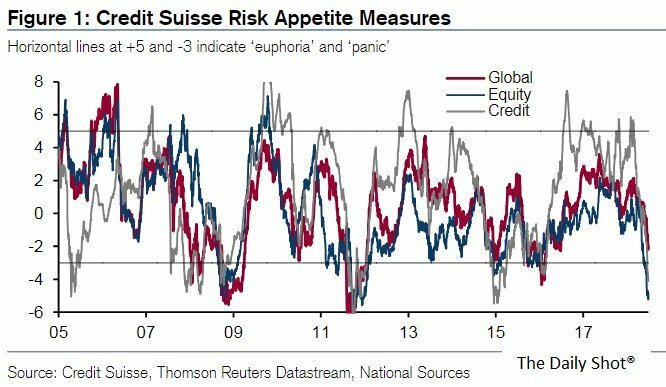 That brings us to the most cursed sector in global stocks – Submerging markets as it is often called. Interestingly, this sector outperformed US stocks on Friday, post NFP. Is goldilocks good for EM? It has been in the past with steady to lower Dollar & Treasury yields stable to falling. But who is putting on a trade on EM?